Though far below the road, the blue-green of the water peeked through the pine trees, tall next to the roadway, and my heart, the heart of a child for whom a trip to water was rare & wonderful & never long enough, that child's heart would almost stop in reverence. Thou art everywhere, but I worship thee here. A prayer I whispered deep in my soul even then, though I wouldn't hear the words until 30 years later. Waiting, waiting, in the back seat of the car, windows rolled down against the summer heat, waiting for that blueness to appear behind the trees, knowing that at any curve of the road it might appear, holding my breath, the suspense almost unbearable, and then there it would be. Its width appeared vertical, and I thought it was the largest piece of water anywhere in the world - how could the ocean possibly be larger? - and that moment of vertigo, when it seemed tall, not deep, was intoxicating. I came to know it was an optical illusion, but it made no difference, it surprised me every year, every year. It is still with me, that first view of a lake over a hill, or through the trees, and it is still intoxicating. Nothing is better. Nothing. To be on the water at any time is to be healed of my worries. In the heat of a summer day or evening time, watching the sun go down. The dark of night - stars overhead silence silence silence so blessed sweating against my skin, the doing of nothingness, floating with my head thrown back to the moon. And that color. Still with me. Not that child's idea of ocean-blue, not the brown of muddy river water, but that greeny blue, made more green against a bright summer sky, but made more blue against the green of the trees. It is everywhere in my house, in my closet. It is the color of Michael's eyes. The image above is part of a painting, a chair I am working on (does it need flowers, I wonder? does it need nothing?) and part of a table in my home. The table belonged to my mother, and was so small in her very big old house - after my father died and she moved to a smaller place, she asked if there was anything I wanted. I took the antique clear glass door knobs from the kitchen drawers & cabinets, and this table. In my house it is huge, and sits next to the front door, front window & I use it all the time when photographing objects & artwork. The natural light is just about right. 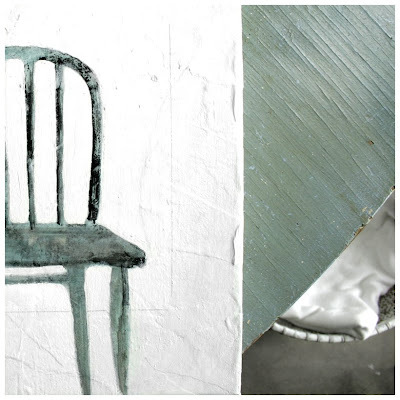 When photographing this painting this morning, I liked the way it played against the color of the chair in the painting, and laughed because it matched so exactly without my even thinking about it. This color is in my soul. And that basket, you ask? a white blanket for her nest. We have so far not had a sunny weekend. If it is the weekend, it is rainy. and my hand to catch the rays. i love it. i love the chair and the way you have photographed it. at first i thought it was two photos - comparing the colors you love so well. yes i'm ready for a sunny weekend too. btw, i like the chair just as is. SYW - When I saw this through the viewfinder I actually thought of y'all - it does look like 2 photos side by side. And bless you for liking the chair as is. I am having a no inspiration weekend, and nothing is working. At least we got sunshine today! Yayyy!!! Again, you have jogged another childhood memory. Of our family trips to the beach. It was a big ordeal getting ready to go and the drive; much like your drive to the lake. With much the same kind of anticipation and excitement and that waiting for the blueness as we drive over the last hill. The red, red dirt. The yellow white of the sand. The blue of the ocean. The smell of salt in the wind and the steady rhythms of the waves. I had forgotten all about this memory until you shook it loose from the shelf! elk - I just love that table - that chippiness, that color. I think I was meant to have it! Paula - Isn't it funny how those things stay buried until just a sentence or a word opens the treasure chest in which they reside? I would've loved the ocean & the sound of those waves. Celeste - Oh, I know. It feels too empty, I'm thinking. I think it's really sitting in a field of wildflowers. I will speak to it & see if it agrees! I grew up spending every summer on a lake, which was unlike all the other surrounding lakes..it was blue in the deepest parts, but the greenest most brilliant turquoise around the edges. I grew up there, learned to waterski there, got stung by bees there, became a fish there and learned to appreciate how wonderful it can be to have such a sacred place that I can always return to if I want to connect to my childhood.